Asus has announced an all-new range of tablets built for businesses, dubbed the ZenPad M series. Under the new series of ZenPad M tablets, the company has revealed two enterprise tablets featuring 7-inch and 10-inch screens. Unfortunately, the Taiwanese company has not shed much light on the details about the new range but we can expect the company to showcase the tablets at the upcoming MWC 2016 event. Asus says that the new M series of tablets featuring Wi-Fi and LTE support will come with pre-loaded with the Asus Device Admin for Mobile (ADAM) system which will allow users to manage devices locally or remotely. Both the tablets come with a built-in Adam console. The feature will allow users to take control of the devices by blocking unwanted actions and also deploying the devices in kiosk mode, which locks down the tablet to a specific app preventing anyone to perform any other task on the device. The company has bundled the Adam tools into the tablets’ Web browser. The company says that the Adam gives these tablets set of API allowing system integrators and independent software vendors to deploy end-to-end solutions in vertical markets efficiently. Asus also claims that the Adam will reduce downtime for infrastructure. 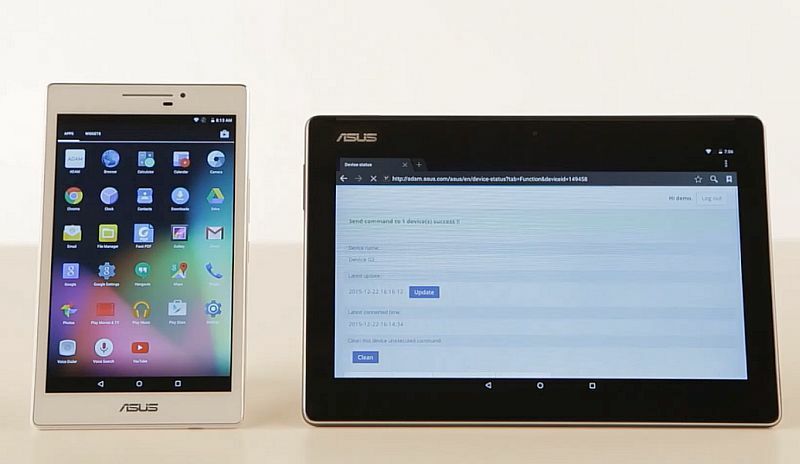 Both the Asus ZenPad M tablets are powered by Intel Core M chipsets. The company has teased some of the features of the new M series of tablet. The tablet was first reported by Notebook Italia website. Asus earlier this month launched its Windows 10-powered Transformer Book T100HA in India with a starting price of Rs. 23,990. The laptop-tablet hybrid was introduced by the Taiwanese tech firm back in June last year at Computex.